With over four decades of international track record in creating and showcasing innovative Indian dance productions, Apsaras Arts was founded as teaching institution in Singapore in 1977 by Singapore’s pioneers in the arts – Mr S. Sathyalingam and Mrs. Neila Sathyalingam, alumni of Kalakshetra Foundation, India. Today, Apsaras Arts has transformed into a premier professional performing company, and it has gained recognition in Indian dance-theatre on an international level, enjoying successful performances in Singapore and abroad. The company has created a repertoire of innovative dance productions, which are performed regularly by the company’s fulltime professional dancers. Shri S. Sathyalingam is a Sangitha Sironmani (Holder of a Degree in Music) from the University of Madras. He joined Kalakshetra and was trained by many eminent gurus and completed his training for Diploma in Music. After his training in Kalakshetra, Shri S Sathyalingam served as a member of its teaching faculty. Since 1955, he performed classical music and conducted Bharathanatyam recitals in India, Sri Lanka, Singapore, Malaysia, Australia, Japan and the United Kingdom. He was a much sort after Guru for Classical Indian Music and seved as the Music Director for Apsaras Arts for a three decades. In recognition of his contribution to Indian arts in foreign countries, he was bestowed the accolade of ìViswakalaa Bharathiî by Bharath Kalachar in Chennai in 1995. He was also a member of Singapore’s National Arts Councilís Music Advisory Panel. 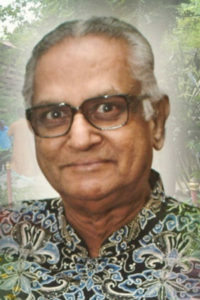 Shri S Sathyalingam passed away on June 20th 2011. The second of four daughters of a well-known dental surgeon, Srimathi Neila Sathyalingam was born Neila Balendra in 1938 in Colombo, Sri Lanka. She began dancing at the age of five, and trained in the classical Indian dance traditions of Bharatanatyam, Kathak, Kathakali and Manipuri at the Shanti Kumar School of Dance and the Kalaya School of Dance in Colombo. In 1954, she won the gold medal at the All-Ceylon Dance Festival and was selected to perform for Her Majesty Queen Elizabeth II in April 1954. At the age of 18, she enrolled in Kalakshetra, Chennai, India, reputed to be one of the best dance institutions in India under the tutelage of its founder Srimathi Rukmini Devi Arundale. Neila completed her five-year course in two years, graduating with a first-class honours diploma in Bharatanatyam and was appointed as one of the faculty members for dance at Kalakshetra. Neila met her husband, Shri Suntharalingam Sathyalingam , at Kalakshetra. The son of a very prominent Sri Lankan politician, he had graduated from the University of Madras with a Sangitha Sironmani and the Diploma in Music from Kalakshetra and was then teaching Indian classical music at Kalakshetra. Together Neila and Sathyalingam founded Apsaras Arts in Singapore in 1977, and have since been promoting Indian traditional art forms in a multiracial Singapore. She has also actively collaborated with other ethnic dance, music and dance ensembles and government bodies to promote Indian dance forms in Singapore and also gaining international recognition. Neila has been successful in creating many dancers and dance teachers through her dedicated teaching. Her students have established their dance careers in Singapore and several countries around the world. Neila has been bestowed many prestigious titles including Singapore’s Cultural Medallion Recipient in 1989 and Viswa Kala Bharathi in 1995 for her outstanding contribution to Indian arts internationally. 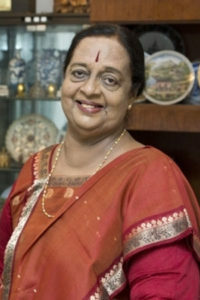 Neila Sathyalingam of Kalakshetra, India. Mrs Neila has been bestowed many prestigious titles including Singapore’s Cultural Medallion in 1989 and Viswa Kala Bharathi in India in 1995. She was inducted into the Singapore Women’s Hall of Fame in 2014, and for her pioneering contribution to Indian arts in Singapore she was named as one of Singapore’s pioneer in the arts in 2015 when the nation celebrated its jubilee year. In 2016, she was awarded the Life Time Achievement award from Bharata-Illango Foundation for Asian Arts and Culture, India. Smt. Neila passed away on 9th March 2017. Apsaras Arts Academy provides dance training in Indian Classical dance genres – Bharatanatyam (Kalakshetra Bani), Kathak (Luncknow Gharana), Kuchipudy and Mohiniattam for both children and adult students. The academy also provides Balabharatham – a special dance course for young kids (4-6 years old). Over the past four decades many students of Apsaras Arts have graduated receiving the title of “Natya Chudar” by performing their Arangetram after completing their course in Bharatanatyam. Apsaras Arts graduates have established themselves as dance artistes, choreographers and dance and have founded teaching institutions in Singapore, Australia (Canberra, Sydney & Adelaide), USA (Richmond, VA , Boston, MA and Phoneix, AZ). Several of Apsaras Arts garduates teach Bharatanatyam at Singapore primary and secondary schools and junior collages, and at Community Centres across the country.